Citation Information: J Clin Invest. 2010;120(7):2265-2267. https://doi.org/10.1172/JCI43632. It is now believed that frequent jet lag or shifts of daily rhythms caused by rotating shift work can lead to deleterious health outcomes. Indeed, many serious health problems, including breast cancer, stroke, and cardiovascular disease, have been linked to an occupational history of shift work. This has heightened interest in better understanding the biological responses to jet lag and shift work, with the hope that this will pave the way to developing compounds that can help people avoid their negative health consequences. In this context, a report in this issue of the JCI takes us to a new level of understanding of the molecular control of the resetting of the multitude of internal biological clocks disrupted in a mouse model of jet lag. An interconnected network of genes and gene products underlies circadian rhythm generation in the mammalian SCN cell. The proteins CLK and ARNTL act by activating transcription and driving the expression of a number of genes. The products of these genes, including PER1, PER2, CRY1, and CRY2, provide a negative feedback signal to inhibit the activational drive of CLK and ARNTL. Several other genes also have feedback roles; for example, the genes encoding NR1D1 and RORα mediate a feedback loop to provide rhythmic inhibitory and activating drive, respectively, to the gene encoding ARNTL. 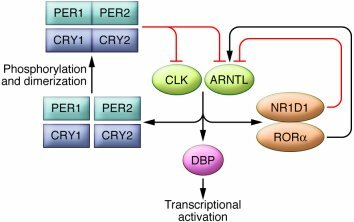 Because Dbp is sensitive to the rhythmic transcriptional activation of CLK and ARNTL, DBP can act as a transcriptional activator for other, downstream genes.